Monster Matsuri cover art….revealed!! What do you think? Why? Because the cover for Book 3, Takeshita Demons – Monster Matsuri, has been revealed!!! Woo hoo! What do you think? – Try this quick quiz: IS YOUR PERSIMMON HAUNTED? – And a Japanese language question: Does anyone know what “matsuri” means in Japanese? What do you think a monster matsuri might be? 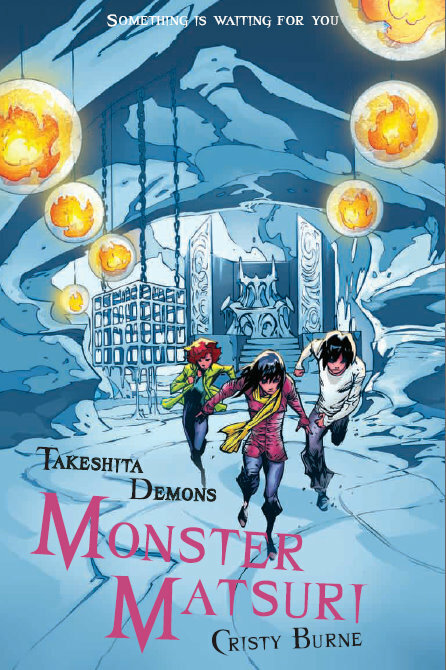 – Enter the Make a Monster competition and win a copy of Takeshita Demons! We’ve had some awesome entries so far! I love the cover Cristy! What’s the name of the illustrator? They’ve done a fantastic job of making your book stand out from the crowd. Thanks Zac! The illustrator is called SIKU and he’s based in the UK. Some of you may have seen his work for Judge Dredd and 2000AD? I’d love to see Siku draw some of the make-a-monster competition entries!! He’s terrific. That would be fantastic. Although I’m not sure I’d like to meet some of these monsters – they sound horrible!